Refugee settlements sprawl across the grasslands of northwestern Uganda. This area, close to the border with South Sudan, is home to one of the largest refugee populations in the world. The Bidi Bidi Refugee Settlement alone is home to 224,000 South Sudanese who have fled the conflict across the border. It is not the first place that springs to mind when you think of a technological revolution but that is exactly what is happening here. NetHope is a strategic partner for the ICT4D Conference 2019 which starts April 30th in Kampala, Uganda. It has been crucial to building an information superhighway in this part of rural Uganda, with funding from USAID. As a nonprofit consortium, NetHope is working to assist its member NGOs supporting the 1.4 million refugees in northern Uganda and another 1 million Ugandans in host communities. These NGOs need internet access for their own operations but also “our members are all keen on using digital tools to amplify the impact of their programs,” explains Timbiti. And the refugees use the internet too, for business, news, and social media. “After all, we don’t want them to be left behind,” says Timbiti. Connectivity has been brought to bear for the challenges the refugee community faces. For example, the Norwegian Refugee Council is using ICT hubs and digital tools for educational programs engaging both refugees and their host communities in northern Uganda. A local NGO in the Rhino Camp Refugee Community, Community Technology Empowerment Network (CTEN), provides technology training for refugees in areas such as digital banking, educational access, and health care information. This was made possible by NetHope’s “connectivity demand aggregation” program. 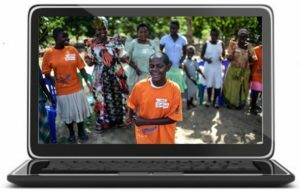 In central and western Uganda, ICT4D Conference founder Catholic Relief Services (CRS) is also using digital technology to boost development. Sustainable Outcomes for Children and Youth (SOCY) aims to improve the health, nutrition, education, and psychosocial wellbeing of orphans and vulnerable children (OVC) and youth, as well as reduce abuse, exploitation, and neglect. It is a major project, reaching more than 625,000 OVCs and youth and case management is crucial to its success. There is also an economic empowerment component to SOCY with Savings and Internal Lending Communities (SILC) groups). In October 2018, CRS launch a pilot to digitize the case management system using a mobile app for Android tablets or smartphones. “The objective is to increase the efficiencies of the case workers, SILC managers, and youth program managers,” says Geoffrey Ssembajjwe, the ICT4D Officer for CRS on SOCY. “We want to improve the linkages of the case referrals outside the project to local government. We want to improve speed, efficiency, and overall completion time,” Ssembajjwe explains. And so far CRS is pleased with the results. “There have been some challenges but overall there have been significant positive results,” he says. Time for case referrals has been reduced and the quality of the data collected by case workers has improved. Also, the time to complete the case form has been reduced, resulting in more time for the provision of services like counseling. “ICT4D has integrated the flow of the case management project, bring all of the actors together,” explains Ssembajjwe. Another benefit is that using the app, SILC managers are capturing the information on how SILC members are using their funds. “We did not have this information before,” says Ssembajjwe. ICT4D is also a large cost in the project. SOCY is using low-cost devices to keep down costs and Ssembajjwe says they will monitor the performance of the hardware. “Currently we are learning as much as we can. It will add benefit to any case management project,” he says.